The SC160A is an indoor chemical storage cabinet purpose built for Class 5.1 Oxidising Agents (160 litre capacity). Keep oxidising agents away from flammables and other incompatible substances in this double-walled sheet steel cabinet. Features of the SC160A include: heavy duty shelving that is fully adjustable along 100mm increments; built in flash arrestors and vent openings that sync with your mechanical ventilation system; high-tech polyurethane coating that resists corrosion. The unit is fitted with compliant safety signage and placards. The SC160A is part of STOREMASTA’s SAFE-T-STORE series — a range of fully compliant chemical stores for keeping Dangerous Goods safe indoors. 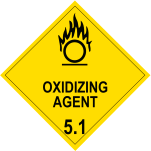 100% designed and manufactured in Australia to the highest safety standards (including AS 4326-2008), order your oxidising agent cabinet direct from STOREMASTA today.